5 Professions that Gandalf could’ve followed in the Modern Real World: A Caricature of Gandalf the Grey. 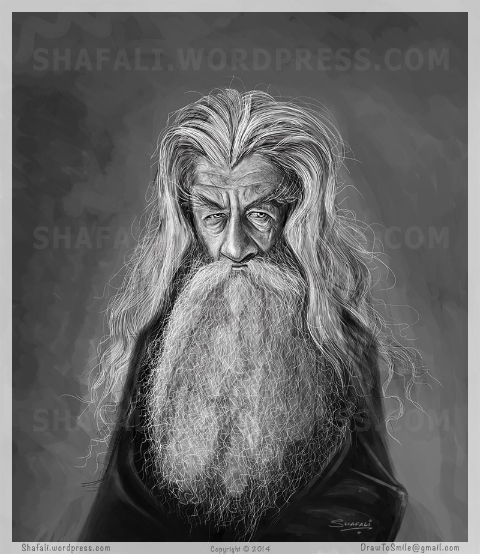 Here’s a grey caricature of Gandalf the Grey that I did a couple of weeks ago. Just some sketching in Photoshop. As I said earlier, I don’t do a lot of digital sketching…but every once in a while, when I want to take a short break, digital sketching comes in handy. Gandalf the Grey – Without his hat, because he’s unable to decide which grey hat goes with his new grey robe. Gandalf is a wizard of the Middle Earth. We first see him in The Hobbit (well, the chronology of the movies in which Gandalf’s character is played by Ian Mckellen, is different from the fictional chronology of the Lord of the Rings saga.) In fact, we see him almost right at the beginning of the book – when he meets Bilbo Baggins the short-statured but totally lovable hobbit, who is persuaded by Gandalf to join a group of dwarves who desperately needed his help to open a door guarded by the dragon. Among all the characters that populate this famous trilogy (which gets rather verbose and on-the-verge-of-tears boring, at times,) I like Gandalf the best. He is multi-skilled and his personality multi-faceted. In fact, if he was a real person instead, he could have chosen any of the following five highly remunerative and rewarding professions. The guy is smart and sensible; on the inside he’s quite like the CEOs of today who specialize in getting others to do things that themselves couldn’t accomplish in ten lifetimes. Here’s an example. He tries to recruit Bilbo for the team; when he doesn’t succeed, he sends the dwarves to Bilbo’s hole, and then attempts to get him onboard. Later, when he’s sure that Bilbo is sub-consciously sold on the idea, Gandalf leaves with the dwarves. When Bilbo joins them later, he thinks of it as his own decision. That’s exactly what CEOs do. They make us believe that we are the ones making our choices, when actually, they’ve already made the choice for us. Trust the judgment of a cynical caricaturist: a highly successful CEO of today lurks behind that grey beard and grayer robe. In today’s world, Gandalf would be a politician par-excellence. He understands the need to create a persona…thus the hat (not seen in this caricature, though), the robe, the muffler, and the gnarled stick. He is a slick talker and has the knack to disappear from the scene just when things begin to heat up. Remember the time when the dwarves and Bilbo meet those three trolls who’d have enjoyed a dwarves-roast, had Bilbo the blundering underdog of the story not blathered to save them? Where was Gandalf then? Guess what – He was away…working, sweating, finding information – for them…not for himself. Gandalf doesn’t do anything for himself does he? It’s all for the people he represents. And we are always expected to take his word for it. While I don’t see his robe sweeping across the Eagle Rug in the Oval Office, I think he could’ve mentored Mitt Romney and Barack Obama and helped them burnish their political acumen. 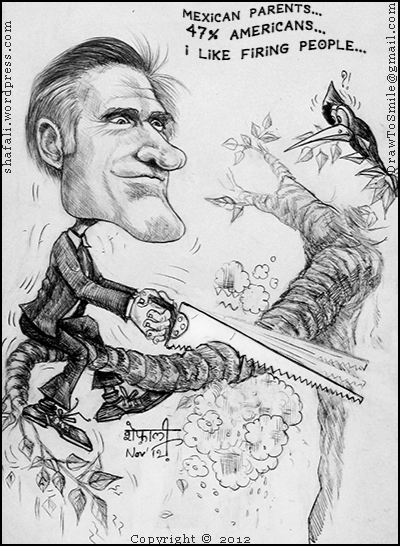 If you don’t remember Mitt Romney, here’s the gentleman doing just the thing that Gandalf would’ve advised him against. Gandalf would’ve really made his parents proud, had he chosen to work as a consultant. He comes across as an extremely risk-averse guy. You never see him putting a single penny of his into the adventures. He just rides along. He guides the adventurers with his knowledge and uses his contacts to ferret out useful information, but do you see him creating or manufacturing anything? For a moment, assume that those adventurers didn’t have Gandalf to consult with; then what? Would they not reach their goal at all? Would they all sit like morons and do nothing. I don’t think so. In the good old times that existed before the now-ubiquitous-consultants arrived on the scene, the world was doing well. In fact, consultants are needed only when people and organizations get into businesses that they know nothing about, so thinks the caricaturist. In this world of ours, Gandalf could’ve been a psychologist with a roaring practice. The LoR trilogy presents ample examples where Gandalf attempts to soothe crushed egos and bleeding hearts. (OK, not just a shrink, an agony aunt too.) He understands how the human mind works. In fact, he also understands how elves, dwarves, trolls, orcs, dragons and all the other creatures of the middle earth think. In fact, if he were real and he lived today, Sigmund Freud might’ve been his disciple – after all Freud could only claim that he knew about the machinations of the human mind, and especially how every mundane human act was powered by sexual desires. 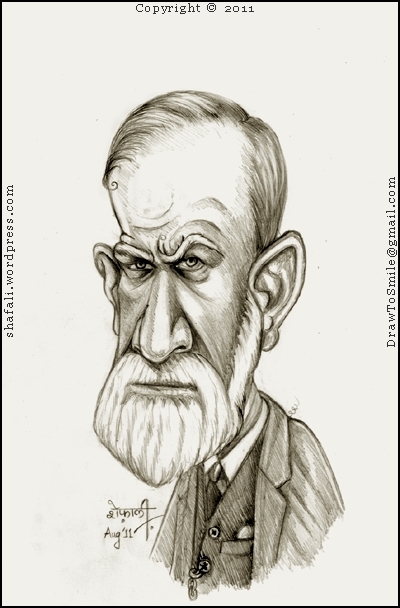 I request those with a keen sense of observation, to compare the expressions of Sigmund Freud below to those of Gandalf’s above. You’ll see what I mean when I say that Gandalf could’ve been the coolest shrink ever. And yet, we couldn’t have an LoR without him, because he’s the guy who knows – and in the days of the yore, in the times of the middle earth, a man with knowledge was indeed handy. He was the middle earth counterpart of the Internet. The adventurers of the LoR trilogy had to just spit out a search-string and Gandalfoogle would whirr into action – spitting out results. 5 Childhood Symptoms of an Artist – for the Parents of an Artist-in-Diapers! If you know me, I try not to tell people how to do something unless it’s about drawing. However, I’ve had about enough of every parent making a future artist out of every little child who may or may not be born to stay creative all his life. (Note that only 2% of the human population retains a highly active right-brain, right into their adulthood.) I’d like all those who love to draw and paint to become artists, and not the vice-versa (either way. Go figure… there’s a 98% chance that you’ve got an active left-brain, so you are the genius,) and this is why I decided to make this post. I expect to be lambasted by some…but I really don’t care – because if you indeed have a little artist in your family, he or she deserves a happier and more productive childhood than your constant meddling would result in. A quick point to note here is that you’d never hear parents saying that their son or daughter is a born doctor, engineer, lawyer, politician etc. Yet, the moment a child puts the first stroke of color on a piece of paper, they begin seeing a Norman Rockwell, a Salvador Dali, or at least an Andy Warhol in their child. The Indian parents possibly see a Raja Ravi Verma, an Anjoli Ela Menon, or at least an MF Hussein in their baby. Given a piece of paper and pencil, every child would draw. My dear parents, a child doesn’t need your constant observation followed by your continual chiding to become an artist. If anything, it’s going to put him or her off art for life. Just because a child draws doesn’t mean there isn’t an Einstein, a Michael Jackson, a Whitney Houston, or even an Abraham Lincoln hidden in him or her. When a child is expected to excel at something that was just a manifestation of curiosity – the expectation and the following demands from the parents could lead to a severe inferiority complex in the child. So, leave the child alone to discover. Kids want to be something different each year, and they generally haven’t made up their minds until they are in their mid-teens. Yet a few of the millions of kids growing up at any given time are born to be an artist, a scientist, a singer, an actor…and because their internal need to become what they are meant to be is in their blood (figuratively speaking,) they end up becoming what they were meant to be – with or without any help from their parents. What the parents can do is, not to block the way of their child’s natural mental evolution. I have an excellent recollection of the things that I hated as a child. These things did make me step away from art many a times. If you are wondering whether I must be pathologically emotional to remember small things such as these, I must make you aware of another fact. If your child is of the artistic-kind, he or she may be over-emotional, over-empathizing, over-sensitive etc. We are all like that. My maternal great-grandfather died when he joined the medical college, because he couldn’t handle the dissection of a corpse that he had to do because his father wanted him to become a doctor and was unable to accept that his son was meant to be a poet. Remember, that if your child is made for becoming an artist, you’ve got a kid who scores higher on emotions and less on practical decision-making. However, if you have a child that’s meant to be a normal, productive, practical citizen of the world, and you’ve branded him or her an artist, you are still doing a disservice to your progeny. You’d build expectations around your child that the poor kid won’t be able to fulfill. This will lead to confusion and overall drop in the development of your child’s personality. While my best tip on this is – let the child discover and choose, don’t brand him or her too early in life, I know that as a parent, you’ll never be able to do that, so.. In my opinion, these are the 5 Childhood Symptoms that could stamp “Artist” on the forehead of your child. Your child’s notebooks and books are filled with drawings that surprisingly make sense to even your jaded senses. Even at this tender age, the artist-child’s drawings will demonstrate an innate understanding of proportions. Note that I am not talking about a hut, three triangular hills for the background, and four stick figures in the foreground. That’s regular stuff. You need not worry that your child will go to the dark side (namely art) if this is all he or she draws. I am talking about newer stuff. Attempts to draw a bird, an elephant, not just a flower, but a rose…that kind of thing. Your child prefers lonely corners to read comics and other illustrated books. Closer observation reveals that the illustrated pages don’t turn for a rather long-long time. The child’s notebooks are now filled with more interesting and more detailed drawings. The proportions in the figures are funnily always right. You begin to fear that your child is beginning to trace pictures and passing them off as his or her own. If you get that feeling, don’t share it with your child. You’ll break a tiny trusting heart. Others (in your family and your friend circle) begin to notice that there’s something special about your child…and they begin to make unflattering remarks such as, “isn’t your child a bit shy?”, “why doesn’t she go out and play?”, “don’t you think you must meet a counsellor?” – Ignore, if your child is really producing eye-catching drawings during this time. Artists aren’t very outgoing people. Even grown artists prefer the solitude of their studios. Talking to people, laughing inanely at stuff because it’s socially appropriate to do so, is an anathema to most artists. Your child tries to impress you by creating a drawing with an unfailing likeness of you, your spouse, or your dog…of the family. While you shouldn’t be the one telling the child that he or she is an artist, when the child looks for approval, you should be the first one to give it. Yes, you need to provide the child with approval not with a set of dos and don’ts. Don’t Prattle. This is also the time when the child will experience negativity and jealousy in the environment. Other parents will begin to question the authenticity of your child’s work, because you as a proud parent will be brandishing the artwork done by your child under everyone else’s noses – and while they’ll go “wow”, “fantastic”, and “prodigy” in front of you, they’ll call your child aside and ask where he traced it all from or whether you were the one who drew it instead. This will imprint on to the child’s mind and will remain there forever. Trust me on this. Around this age, your child’s progress as an artist will accelerate. Recall that mediums don’t ever matter to an artist – nor will they to your little budding artist. Let the child be, and unless the child wants to show you stuff, don’t meddle. Also don’t go around telling everyone in the family how good an artist your child is. It may help the budding singer, the budding dancer…or any other budding performance artist; it doesn’t help the budding artist. The output of the artistic process requires many iterations before it becomes perfect, and believe me, it’s a time-consuming process. Asking a child to draw something from scratch in front of a group of uncles, aunts, cousins, is like setting up a time-bomb in the child’s heart. The kid wants to please you, and so tries to draw under pressure, and fails to create something that is really pleasing. This remains in the child’s mind forever. In future, your child will either hide the drawings from you, or draw less. If your child is an artist and you know it, let it be a secret between both of you. Remember that a painter is not a performing artist – a painter is an introvert by nature, a performing artist an extrovert. A painter lives in a world of imagination, a performing artist thrives on interactions. Also remember that the right brain is not just associated with creativity, it’s also associated with feelings, imagination, intuition, and mental imagery. So this child will be a lot more sensitive to everything – to the good and to the bad. This is the time when you reap the fruits of your labor, either way. If you kid was meant to be an artist, either your constant ministrations, your attempts to show-off, and your unrealistic expectations have already veered the child completely off art; or if your kid was meant to be next Einstein, you’ve woven a complex web of confusion around the child. This is also the time, when in 9 out of 10 cases, you wake up to realize that your kid drew only because all kids draw, and that now he or she must become an engineer, doctor, lawyer, or if nothing else, at least a politician. However, if your son or daughter indeed were to become an artist, you’ll see symptoms such as an increased propensity towards loneliness, increased consumption of art material, increased disregard for neatness…and so on and so forth. If you see this – talk to your child, send him or her to an art-school instead of forcing the kid to find an alternative to Napier’s Constant or dissect a poor squirrel. Most painters are drunk on their imagination – so if you begin to see that dreamy look in your teenager’s eyes, don’t assume the worst. Now you know that a dozen years or so ago, you really had given birth to an art-prodigy. I’d still recommend that you let the artist child be and not indulge your natural desire to bask in the glory of your child’s abilities. It is going to increase the work-load on your child. Didn’t get it, did you? Let me illustrate. I can’t even recall the exact number of free drawings I’ve made in my life – until one day I was so broken that I decided to decline every damn request of free drawing that came my way. I presume I hurt people on my way – if hurting freeloaders counts, but I just couldn’t bring myself to draw for nothing again. The thought had begun to repel me. Twenty years of drawing for nothing is something, isn’t it? Remember that art too takes time, energy, and it often leaves you with lower and upper back problems. The more you tell your relatives, friends and associates about your child’s artistic abilities, chances are that she will be spending all her waking moments, making free stuff that will hang in someone’s bathroom – all because you didn’t want your child to say no to Mrs. X or Mr. Y. In my opinion, a real artist is someone whose work is appreciated by the common man on the street – he or she is the one who was born to be an artist, because this person doesn’t need someone with a studied, conscious, acquired appreciation of art, to appreciate or criticize his or her artwork. We all are born with the innate visual sensibility that helps us differentiate between the artistic wheat and the feigned chaff. This is why, a real artist is appreciated by everyone (exceptions being those who have a personal axe to grind with the artist,) and such artists can exist as nothing but artists. Dear Moms and Dads, remember that facilitation is different from force-feeding. Making an 8-year old child take a course in art, just because you think she or he is good at it – is forcing them to change a happy vocation into a duty. The best help that you can possibly offer is to be there for them when they need you. 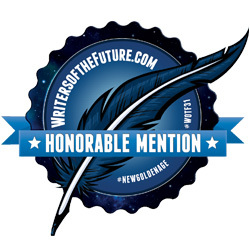 These kids are different – they are both a little better and a little worse than their peers. Artist-kids (for want of a better term,) have visual memories. They’ll always remember everything visually…and some of them will possibly remember visuals from the time when they were two or three years old. Those visuals won’t make sense to them until much later, but as they mature, they’ll begin to give meanings to each of those visuals. I don’t know how you’d like to use this information, but I hope it helps. This post is based on an artist’s experiences and recollections. It’s not based on any sort of controlled research done on child-artist guinea-pigs. Use the tips given with caution. Apply your parental instincts to decide what’s right for you and your family. By Shafali  Posted in Personal, Satire, Smashwords eBooks, The Philosophy of Art, Unexplained Stuff	 Tagged 5 symptoms of a child artist, artist child psychology, childhood of an artist, children and comics, comic-lovers, do you have an artist child?, dos and don't for parents of artists, introvert vs. extrovert children, is my child an artist, is my child an empath, is my child artistically gifted?, my kid likes to draw, performing art vs visual art, right-brained vs. left-brained, tips to parents, why is my child over-sensitive? The Caricaturist meets and befriends Anthony Tweiner in Atlantis! New Visitors, Please excuse this idle prattle of a flu-ridden caricaturist who has temporarily lost her ability to appreciate the difference between reality and fiction. Usually she isn’t like this. When sane, she knows that Atlantis is real, Internet is virtual, and the real world is fictitious. If you are here on a serious errand, please don’t waste another precious moment on this post. If you are looking for caricatures to ridicule a celebrity of your choice, please click the Gallery Icon in the right sidebar. 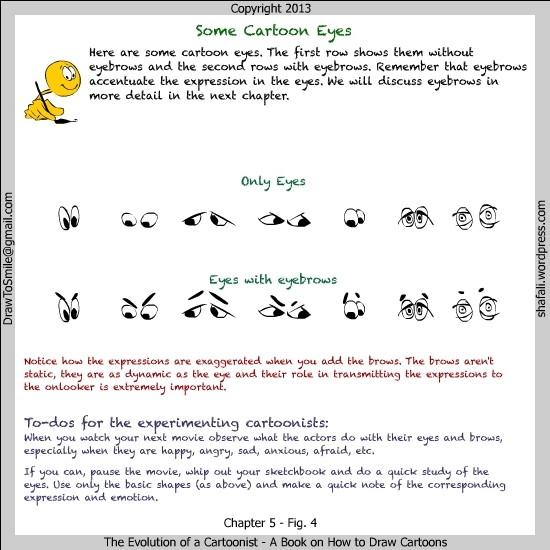 If you want to learn how to draw caricatures and/or are specifically looking for my book “The Evolution of the Caricaturist”, again check the sidebar, and add your email id in the tiny form given there, or use this link here. I’ll email you when it comes out on the App Store. It is due to arrive there shortly. 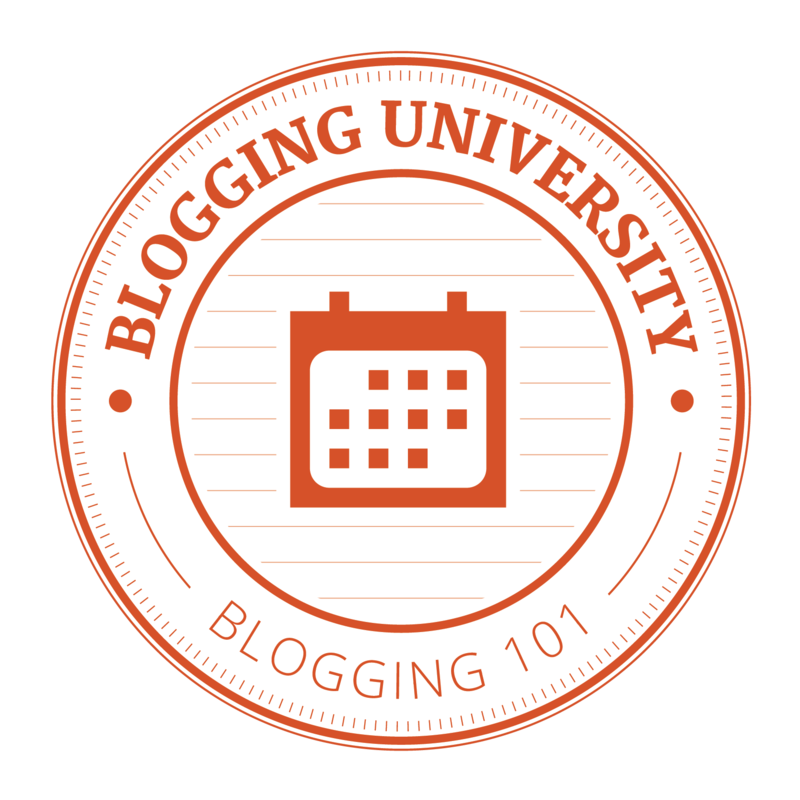 If you are wondering why the Interactive tutorials aren’t up yet, it’s because I lost the free fonts that I had used in those tutorials and now I need to replace the fonts, reformat the tutorials, and re-export them before I serve them from my new site. Most of my readers know that Atlantis is my favorite blog-holiday destination. When I disappear from the blogosphere, it’s because I’ve snuck off to Atlantis. I am still here in Atlantis and I am here of my own volition. You don’t have to remind me that the first time that I visited Atlantis ever, it was not because I wanted to, but because I was abducted. You may call it the Stockholm Syndrome, but I developed a soft-corner for my abductors when I realized that all they wanted from me was to create a caricature illustration of a happy couple, which could be given to them as a wedding gift. I happily complied with their wishes, completed the caricature, enjoyed the party, and went off to bed in a beautiful room that had a huge glass wall on one side. On the other side of this wall was the ocean, and I could see the corals, the sea urchins, and also a giant vampire squid that had this really scary unblinking stare. I admit that the wall was slightly unnerving on my first night there, but I soon got used to it. In fact, I gave the squid a name – Anthony Tweiner. In my humble opinion, the Atlantasian vampire squids are the Sheldon Coopers of sea. I say this because on my next visit to Atlantis, I requested for the same room and tapped Anthony Tweiner on the glass wall, and Mr. Tweiner, who was nowhere to be seen until then, appeared suddenly, recognized me and dashed towards the wall. Thankfully all his weiners…oops, tweiners (it appears that I can’t get over my tryst with Mr. Anthony Weiner’s caricature,) were neatly tucked in behind him, or he would’ve broken a couple. He was happy…, rather elated…, umm…, actually rhapsodic, to see me back. I too was happy, but about something else. I celebrated his lack of access to an Internet connection or he would have tweeted the closeups of all his tweiners to me – and the kind of open-minded society that Atlantis is, they would’ve told me that it was Mr. Tweiner’s way of paying me a compliment. Anyway, I don’t want to split my split-ended hair anymore, nor spin a long yarn longer, so to snip them both short – I’ve been visiting Atlantis quite often. And why not? They pay well and they treat me like a queen, because none of the Atlantasians draw (you won’t either, if you were living in a Utopia that had a per capita annual income of $100K (that’s the exact double of the US), no taxes, no sexism, no racism, no terrorism, none of those other myriad -isms that humanity is plagued with.) They’ve also set up a small studio and office for me to work from, and anointed me as the National Caricaturist of Atlantis. And I must not forget to mention that I’ve got Anthony Tweiner to keep me entertained. This is why I sneak off to Atlantis whenever I can, my friends. Speak up please. I can’t hear you. Why you, why not us? Oh I get it. You are wondering why I get to become to the National Caricaturist of Atlantis, and why not you. You see, it’s quite like religion. They say if you believe in heaven, you find it; if you don’t then you don’t. If you believe in Atlantis, you’ll find it; if you don’t, you won’t. So, will I see you here, sometime soon? 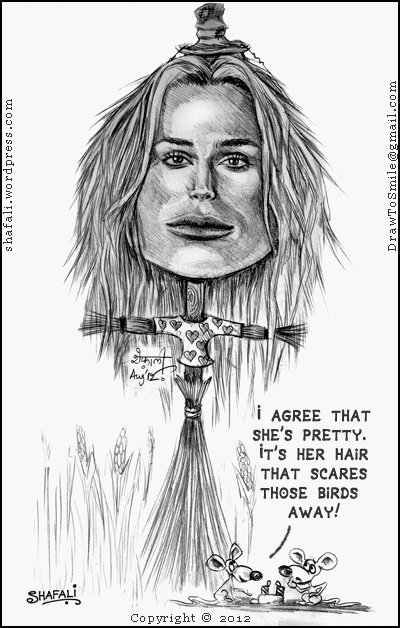 Portraits vs. Caricatures – Some thoughts. In this post, I’ll differentiate between caricatures and portraits through their intent, structure, and usage. A portrait is an close approximation of a person’s face/figure in a manner that it captures the person’s attitude and personality. A Caricature is a humorous likeness of a person’s face/figure, created through selective exaggeration of his/her physiognomy (facial features) and other physical attributes. Let us now compare the two definitions. They are both an artist’s interpretation of a person’s face/figure. A Portrait is a close-approximation of the real face/figure, while a Caricature uses selective exaggeration. A Portrait is based on a serious study to capture the mood, while a Caricature creates a humorous likeness. These differences can be analyzed and reorganized under Intent, Structure, and Usage. They differ in intent, or in the intention with which they were created. Portraits are usually created as a memorabilia. Sometimes they are created to celebrate a person’s status or to mark an occasion. Generally they are created to address the esteem needs of a person. 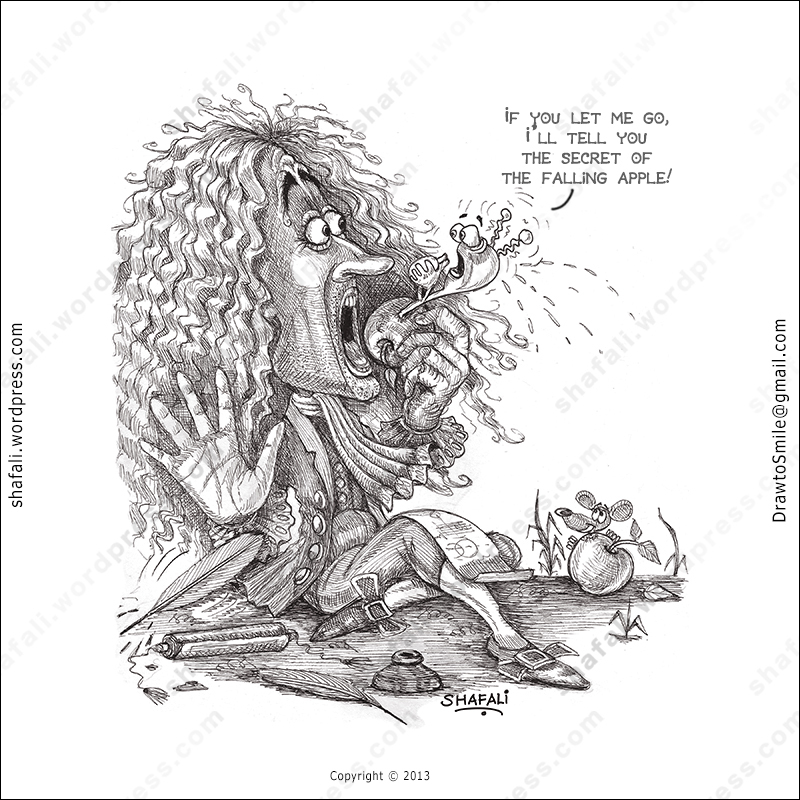 Caricatures, however, are tight little bundles of humor, wit, or satire. They are created to present the subject in a funny manner. Caricatures ridicule and sometimes even insult the subject. When the objective of a caricature is merely to present the subject in a funny light, selective exaggeration of the features does the job. Ridicule and Insult usually requires that in addition to making the subject look funny, the caricature should also tell a story. Caricatures on the other hand, are created by exaggerating certain/all the features of the subject. Thus, a long nose becomes longer, small eyes become smaller, light wrinkles go deep, and a jutting chin juts out some more. Such exaggerations aren’t limited only to the face. A man with a slight stoop bends over totally, a woman with a tiny waist ends up with almost no waist at all. Portraits find their place on the walls of the living-rooms, the conference halls, the important buildings…in fact, portraits bring forth the need to respect or at least acknowledge the subject of the painting. If you see a portrait of someone in a certain place, you can be sure that the subject of the portrait is/was an important person for the inhabitants of that place. Caricatures often have a shorter life and generally people don’t want to display them in prominent places. 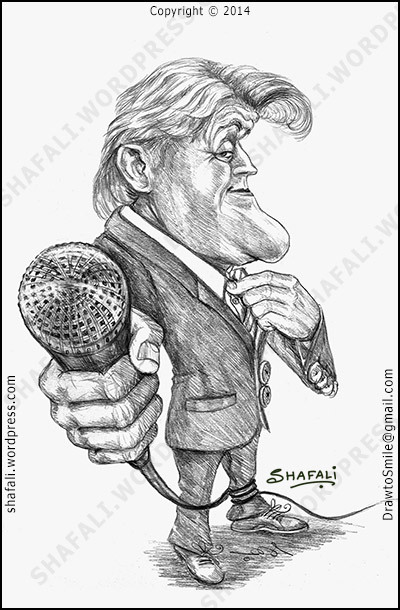 Political/celebrity caricatures are often created for magazines and newspapers so that they may print them alongside to present a witty/humorous angle to their features and stories. 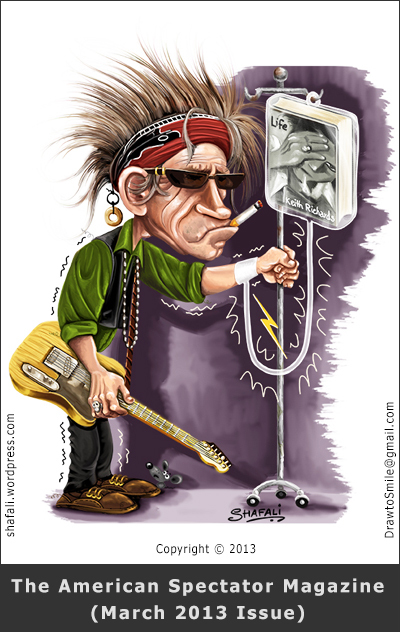 Individuals too sometimes get their caricatures done, usually to mark an occasion (such as marriages, birthdays, etc.) 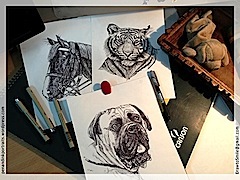 Quickly drawn, sketch-caricatures are often drawn live. 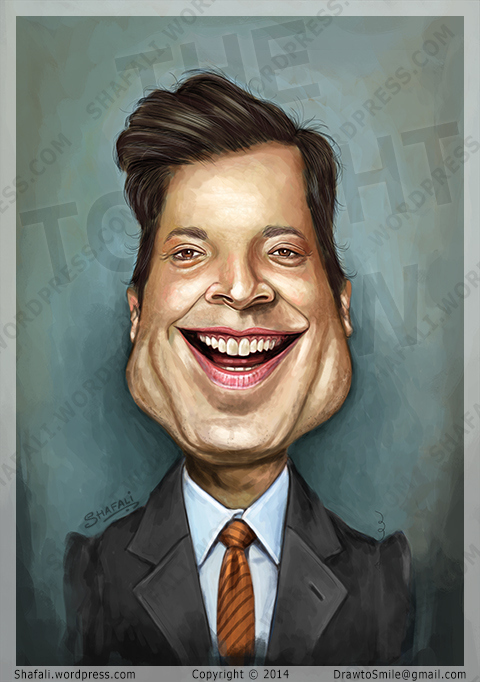 Live-caricatures are often used to spice up parties and other such events. 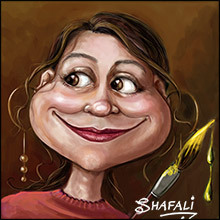 By Shafali  Posted in About Art, About Caricatures, Evolution of a Caricaturist, humor, portraits, Satire	 Tagged caricatures definition, difference between portraits and caricatures, live caricatures, portrait definition, portraits vs. caricatures, uses of caricatures, where are portraits used? Neanderthal Man Outclassed while Gaddafi and Hitler enter an Art Competition! Some more search terms that brought people here…and my favorite is…”Neanderthal Man realizes that he’s outclassed by Homosapien Man”! Until today, I didn’t know if WFTs ever favored Hitler. If I were a WFT, I’d have bitten his head off. The Alsatians never had a chance because they were bred by those Nazi jokers. But then, what did I know – until this search made me wiser. Hitler did have a white WFT and his name was Fuchs. His mistress eva braun had a couple of Scottish Terriers – but the lady was no dog-lover, so I wonder whether those terriers were more of a style statement. Ah well. In these times of Internet and Social Networking, who isn’t? I mean I am depressed and my dog is lonely. I am depressed because I don’t have enough FB friends, Twitter Followers, Blog Followers etc. and my dog is lonely because I spend hours on Internet – the time that I should be spending with her. I squarely blame my environment for making me depressed and lonely. I’d love to sketch a Freudian slip, preferably with a lady inside. You know that it would have two holes you know where. What? You don’t believe me, do you? 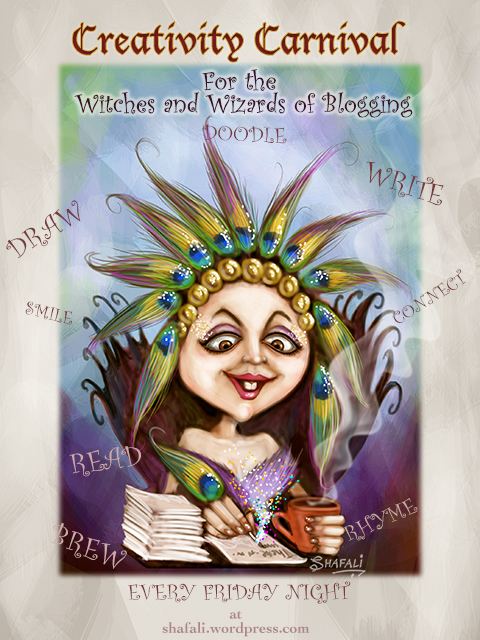 You are reading the blog of a caricaturist – so what do you expect? 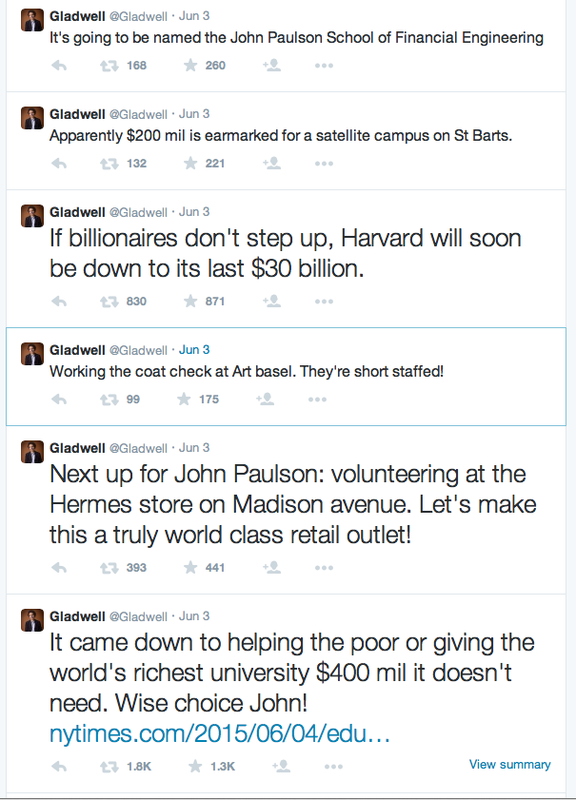 Academic brilliance combined with Journalistic Integrity? Forget it, my friend. To me, a Freudian Slip will remain a slip with two strategically placed holes. Then you must be looking for this gentleman. Sorry – never thought to caricature him. I didn’t think he was, until they found Tom Hanks for the role. Now, I don’t know. Hitler was an artist, but he couldn’t have made Gaddafi’s caricature because he was “apparently” dead before Mr. Gaddafi arrived on the scene. I think that my dear searcher was looking for Hitler’s caricature by Gaddafi instead…and ended up finding both the caricatures by Shafali. Tsk…tsk. It’s becoming more and more difficult to find the real thing. I don’t think they are going to be very good ones. If someone’s asked you to do live-caricatures @1 per minute, he must’ve escaped from 1. A Zoo, 2. An Asylum, 3. Guantanamo bay – so the best course of action for you is to disappear! If you have been here before, you might be wondering whether you’ve arrived at the right address. I assure you that you have. While I’ve made a few changes to its look, but underneath it’s still the same. Nothing has changed, except that I’ve tried to make it easier for you to find my caricatures (new ones are coming…) and that I’ve taken off a few other pages from the menu. “Cool Caricaturists” will return on the sidebar, “The Evolution of the Caricaturist” can be accessed from the sidebar even now, and a couple of other pages have been renamed. My eBooks (sadly only two so far) are primarily satire and so they find a place under “Satire“. “The Time Machine” page is no longer there on the top menu but it’s available through the side-bar (yep! the avuncular looking gentleman with those soda-cap glasses.) The Gallery remains open 24×7 – accessible from the top- and the side-bars. I’ve also updated the “About” page. This page used to be about a paragraph long earlier, and it led some of my visitors to share the observation that I am pretty stingy about sharing who I am. That isn’t true anymore for almost every important bit about this crazy caricaturist can now be found on the page. If your curiosity is piqued enough, check it out ! 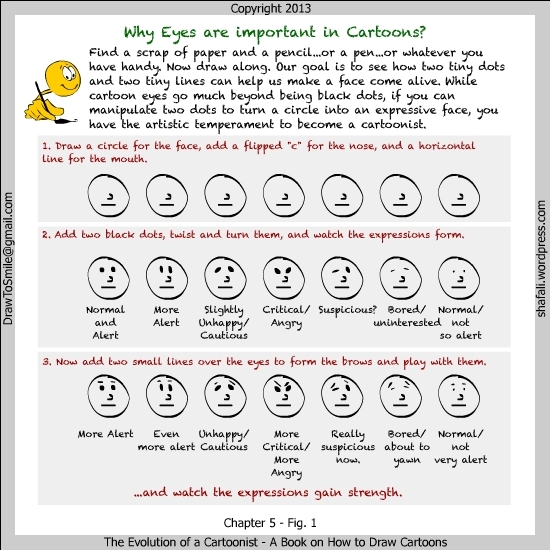 Evolution of a Cartoonist – Post 3 – How to Draw Cartoons – Can YOU become a cartoonist? 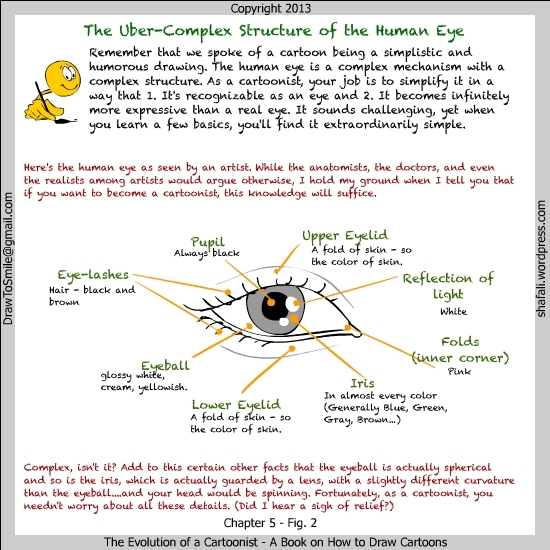 Evolution of a Cartoonist – Post 1 – How to Draw Cartoons – Introduction, Working Definition, and Three Examples. 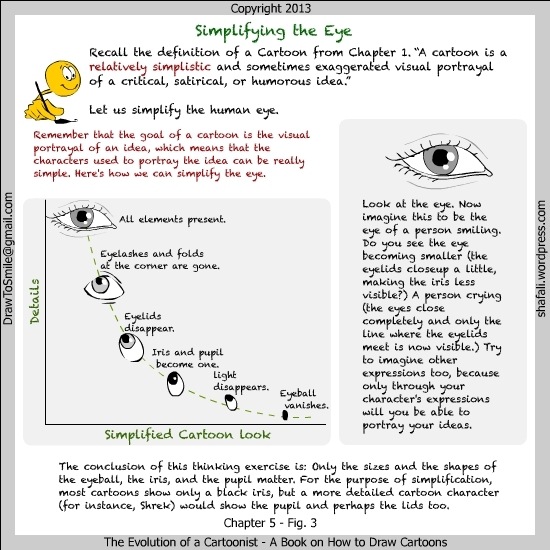 Evolution of a Cartoonist – Post 2 – How to Draw Cartoons – The Two Essential Dimensions of a Cartoon. This post helps you answer the question – Can YOU become a cartoonist? This question is contextual, and the context is that of your current abilities. Here’s a continuum that you must find your place on. If you are like the guy at the right, you are worried about expressing your ideas in a visual form. However, if you can identify with the guy at the left, you can draw and illustrate but you worry about finding the right ideas. If you are an idea-generation machine but you feel constrained by you drawing abilities, you need to pick up some basic cartoon-drawing skills that can help you do “a relatively simplistic and sometimes exaggerated visual portrayal” of the many ideas that keep rushing in and out of your minds, so that you may capture them into an awesome cartoon. However, if you feel that you are Mr./Ms. Ideo (represented by the day-dreaming gentleman in figure 2 below) – and that no matter how you wield that pencil, you can do no better than create a squiggly, you may want to team-up with an artist, who can create a picture that goes with your ideas…or perhaps, you could learn to create ultra-simplistic, Dilbert-Style cartoons that can speak your mind. Mr./Ms. Ideo (The Conceptualizer in the following figure.) needs a visual medium of expression that can be used to capture those ideas that will grow wings and fly away, if they aren’t caught and trained. If you have placed yourself on the right side of this continuum, you must learn not only to generate ideas, but also train yourself on keeping them. I’ve gone through the learning-to-generate-ideas phases, and I must tell you that it isn’t easy. However, if you are like Mr./Ms. Arto ( represented by the horrendously dressed, lip-smacking (!) gentleman in figure 3 below) you might find that you require considerable practice to ensure that you find your ideas and keep them too. Perhaps a helping hand from a friend who has a fertile mind, could help. Yet if you teamed up right, you could end up creating fantastic cartoons to delight your readers. Mr./Ms. Arto (The Illustrator in the following figure) can draw, but he faces issues in finding the right ideas and visualizing them in a way that fits them into the cartooning mold. (This end note is for those bright individuals, who think that they aren’t cartoonists and so they mustn’t create cartoons – and who identify themselves better with Mr./Ms. Ideo, I must mention the Johari window here, which speaks of the “Unknown Room”. Perhaps a comic post on the Johari Window is due on this blog, but for the time-being, it should suffice you to know that the Unknown Quadrant of the Johari Window, now called the Unknown Room, refers to your traits and skills that nobody know anything about, but they exist. Cartoons have a mysterious power to reach into the hearts and minds of people, and shake them out of their stupor. Before we move on to the apparently more practical matter of explaining what a cartoon is, I must mention the fact that sometimes the cartoons that change the face of the world, don’t come from the cartoonists. We’ll discuss the reason behind this anomaly later, but let me share an example to corroborate my viewpoint. Benjamin Franklin, officially created the first American political cartoon in 1754, which depicted a snake severed into 8 parts with a caption “Join, or Die” to bring together the colonies – thus, sowing the idea of the United State of America, in the minds of the people. Franklin is considered to be one of the founding father of the United States – among other things, he was an author, politician, scientist (he invented the bifocals and the Franklin Stove,) and a musician. Did you read the term cartoonist anywhere? Reflect upon it while I disappear to bring you the second chapter of this book “Evolution of a Cartoonist” or the fourth post in the series. I hope this book will sow the seeds of cartooning into your mind, and motivate you to express your ideas in this delightful visual format. This is the abridged first chapter of the of the book, “The Evolution of a Cartoonist,” which will be substantially richer in content (theories and methods,) graphics, and examples is expected to be published by June 2013. The book will also include cartooning problems and assignments for practice. During this time, as and when I find the time to scan/photograph my sketchbooks and put together a cohesive summary of the chapter, I will publish it on my blog here. I believe that everyone who can think and write, can make cartoons. Everyone gets ideas. Everyone would love to see their idea form into a cartoon. More often than not, the constraining factor is – the drawing skill. While almost everyone has got some experience with drawing, practical concerns made them forfeit their drawing skills. If you are such an individual, this book could help you rediscover and hone your ability to draw and motivate you to create cartoons that speak your mind. 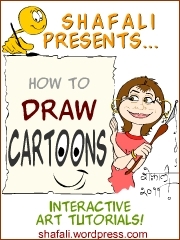 Can YOU become a cartoonist? Cartoons have always enthralled mankind, but with the advent of printing, their impact increased tremendously. Since the last century, cartoons have become a potent tool for bringing about social and political change. They’ve been the voice of the common man on street, and they’ve made many politicians shiver in their knickers. However, the mighty cartoon has often been misunderstood. While cartoonists have struggled to find the middle ground between illustration and ideation, others have often wondered why they couldn’t be cartoonists themselves. After all, most cartoons look simple enough to draw! A ludicrously critical or satirical drawing or caricature, as in a periodical. – Webster’s Collegiate Dictionary of the English Language. I think that none of the two definitions do justice to the raw yet mysterious power of a cartoon. Let me use these two definitions as a base, add to them my own observations and experiences, and structure this simple yet more complete definition of a cartoon. “A cartoon is a relatively simplistic and/or sometimes exaggerated visual portrayal of a critical, satirical, or humorous idea.” – Shafali the Caricaturist. Let me illustrate this definition through some examples. Peanuts by Charles M. Schulz is a cartoon (more specifically, a comic strip, which is a string of cartoons with a common idea holding them together,) because: It is a relatively simplistic and exaggerated visual portrayal (compare to realistic visual portrayal) of a (subtly) critical, (sometimes) satirical, and/or (definitely) humorous idea. While the other two examples were from popular comic strips, here’s a stand-alone cartoon. Let us see how this fares on the definition. 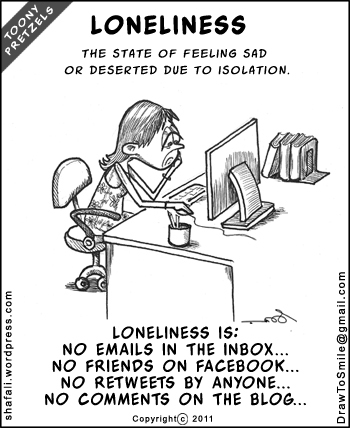 “Loneliness” is a cartoon because it is a relatively simplistic and sometimes exaggerated visual portrayal (a simplified sad woman with an exaggerated expression of sadness, sitting in front of a simplified computer at a simplified desk, in a simplified chair,) of a critical (yes,) satirical (yes,) or humorous (not very) idea. The three examples given above are enough to tell us how widely cartoons differ from one another. A cartoon could be made using a few lines (Dilbert) and it can be made by using millions (Kal’s toons in The Economist); it could be used to present criticism, satire, or humor; it could be done in black-and-white (Dilbert again) or in hundreds of colors (Asterix); it could be political, social, organizational, historical, or even educational. This is also why most of us have the potential to be good cartoonists in our own areas of expertise. It’s important to remember that to be a good cartoonist, you need not be a great illustrator. We’ll talk more about it in my next post, which will present the second part of this chapter, to discuss the two essential dimensions of a cartoon. Sinister-handed Lefties are the Smarter Lot – A Case for the Left-handers! Left-handedness is a trait that makes you special. Among the right-handers, a left-hander is the center of everyone’s attention. Secretly, every right-handed person wishes for the boon of left-handedness, because it makes one special…in whichever way. So, if you were born left-handed, rejoice. Because people around you envy the fact that to look different, all you need to do is be yourself. Those right-handers also envy you because you are smarter, more creative, and infinitely more interesting than them, but then this too is something that they’d never confess to you, ever. Yet, the left-handers of the world have been called names. They’ve been called sinister-handed, southpaw, cack/cacky-handed (clumsy) Why? Because every damn thing ever made was made for the right-handed people, and the lefties appeared obviously “clumsy” when they used them. I wish there were a place where everything was made for the left-handed people, and then a few right-handed, “dexterous” people were let loose in it. I’d like to see how they continue to remain dexterous! Nevertheless, the left-handed people do a good job with these right-handed instruments, because they have better visual sense and the ability to analyze space. I agree that it’s a freaking pain to cut fabric using the scissors manufactured for the “dexterous” majority (and, trust me, it’s a bigger pain trying to find a pair of scissors for the left-handed,) yet the lefties will give you a straighter cut than most of your right-ies. Some of the lefties are ambidextrous, which means that they are able to use both their hands with equal efficacy (well, according to this link, ambidextrous also means – deceitful and bisexual – do you see how the right-ies try to bring us down at every available opportunity?) The ambidextrous appear magical to the normal, rightly-gifted lot…and magic is more often feared than revered. This makes the ambidextrous lot angry, but there isn’t much they can do about it. So they go into their shells to save themselves from those wide-eyed, crazy looks that they get, and they hide themselves from the world. The fact that I can draw with both hands at the same time, the fact that I can write in reverse without ever practicing it, could’ve been a normal thing for me; but when I was in seventh grade and stupid enough to demonstrate it in front of my friends, I lost them because their parents thought that I was a witch. And so I kept it hidden, but every once in a while when I get lost in an idea, I start using both my hands to draw it out. Yet the moment I catch myself in the unspeakable act of allowing my sinistrality (note that it isn’t even a proper word) to work together with my dexterity, I stop to look around and check whether anyone’s watching me. Wonder why people don’t give that funny look to themselves when they type with both hands, or when they swim using all their limbs. I spent a long time worrying about hiding my weird writing and drawing habits, and now I’ve reached a point where I don’t care anymore, especially because these sinister abilities didn’t harm me in any way. Here’s something for people who worry about their kids being left-handed/mirror-writers. I survived and I survived well. I’m good at Math and Physics. I studied Engineering and then worked as an engineer. I successfully competed in many national entrance exams, and I even topped one of them. I can read, write, and speak two languages, and I can learn the script of any language almost overnight. I can draw better than many and I am not clumsy at all (but don’t put me behind the steering wheel or I’ll drive you right into the oncoming traffic). If you are a lefty or a parent of a lefty, there’s no reason for you to worry. You (or your child) are gifted.